Roll all nine alphabet dice to start building a word. Keep the letters you need and re-roll the others. 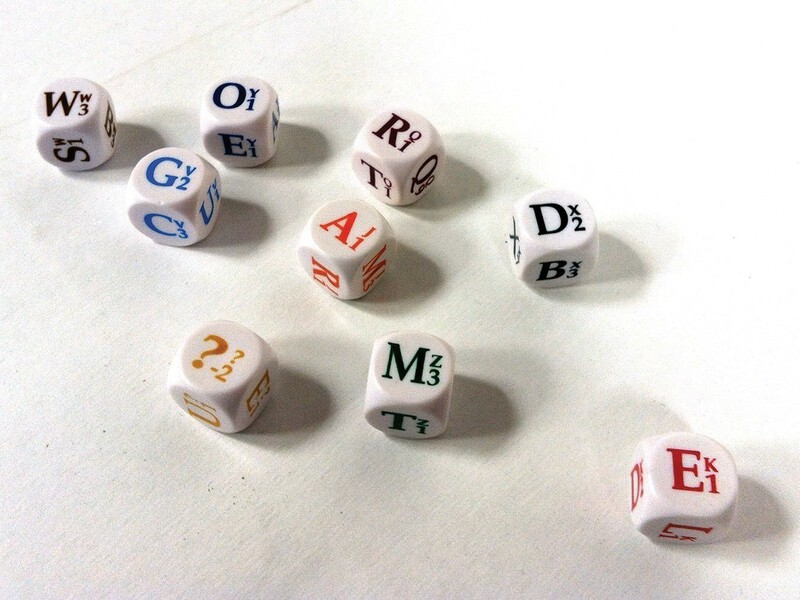 Decide on which letters you will keep to make a word and which dice you will re-roll by checking the Dice Table. The color-coded Dice Table shows you where the letters are that you need to complete your word. You get two more tries. After your third roll (or sooner if you want) score your word. First, add up the values of the letters used in your word. Then, multiply this number by the number of letters in the word. Example, the word QUEUE has a face value of 13. Multiply by 5 (five letters) to get 65 points. Blister pack dimensions 3.825" x 9.5" ; Tube dimensions 6.5" x 1.125" x 1.125"
Dicewords is an excellent, very well realized game, not to mention a very portable one - the dice, rules and scoring sheets are all contained in a snug little plastic tube. Also, the packaging is designed in such a way that there are no superfluous bits of plastic wrapping or cardboard that will end up on a landfill somewhere. A small point, perhaps, but an example of the kind of thought and consideration that’s gone into every aspect of the game. Dicewords is a class act through and through, and I’d recommend it to anyone. I purchased this game recently and have become addicted. It's great for 2 players or more. After playing it a few times, we settled on 4 minutes per person which is just enough to put the pressure on and keep the game moving between players. Owing to its size and weight, it’s ideal to take on holiday for couples or families. Beware though, you may need a dictionary to resolve disagreements in spelling! What a great game. We have just played it all around Australia and New Zealand and are now sending some out to some of our hosts there. Thank you.ome out to some of our hosts there. Thank you. 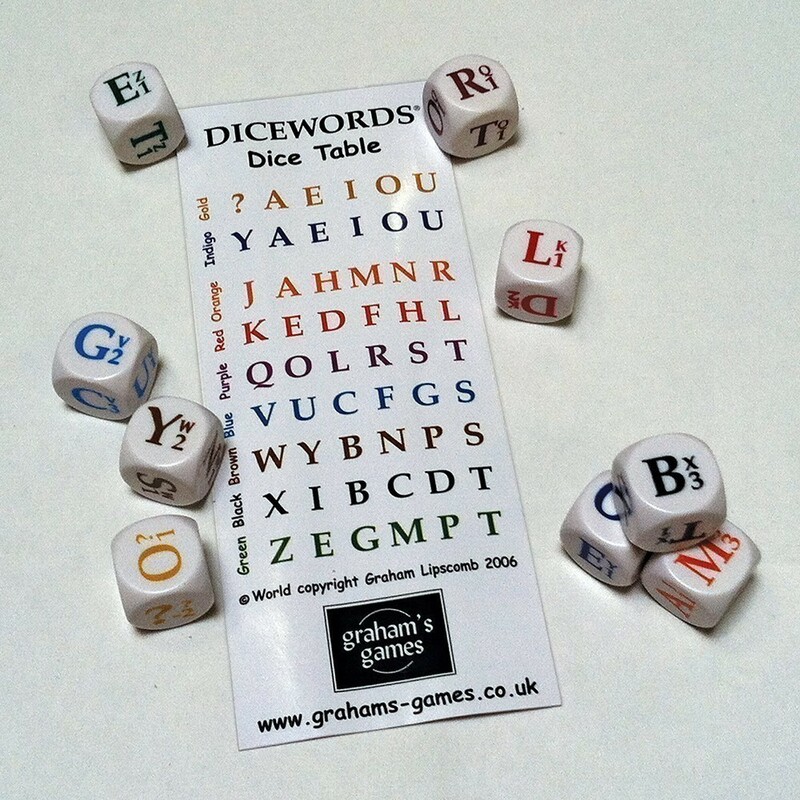 Like many of the best ideas, Dicewords is very simple and the rules can be learned in a couple of minutes. It has elements of Scrabble and Boggle (and no doubt other word games) but at the same time has its own unique character. It's extremely flexible: it can be played anywhere, with any number of people, for any length of time, and with any level of skill. It can be enjoyed by everyone - from the 6-year-old who can spell a couple of dozen words to the hardened Scrabble fanatic. However, what I personally enjoy most about it is the collaborative element. While Scrabble tends to generate long silences as players struggle with impossible letter combinations, and Boggle creates frantic mayhem while everyone races each other to get the most words, Dicewords invariably seems to encourage co-operation between players. Although each player has their own turn with their own letters, everyone else can watch them put a word together and this often ends up as a group activity. Most of my best words have been made with other people's letters! This does, of course, mean that winning the game is a rather random affair, but it's a great deal more fun than sitting silently for an hour or so. For this reason, it works well as a party game and is a great icebreaker if you have friends who don't know each other well. Of course, it can also be played in a deadly serious and competitive fashion, if that's what you want. Anyone who enjoys word games will love this, and I can imagine it would work very well in an educational environment too. Dicewords is probably the most compact word game ever. It comes in a smart tube, small enough to fit in your pocket. But despite its size this game is certainly substantial! This is a great game for 2-4 players, comprising nine dice with a different letter on each face. A player rolls the dice and then has the opportunity to roll each dice again up to three times with the objective of making the highest scoring word. Each player takes a turn, and the scores are totted up. Play resumes back with the first player until a player reaches a pre-decided winning total. The way the scoring system works is quite clever too, in that there is a compromise between the length of the word and complexity of it, as each letter has a different score associated with it. To score the turn, the number of letters in the word is multiplied by the score of each of those letters (the tube includes a multiplication table to ease you through this). This is a rewarding game where the chance element is large enough to bridge gaps between different intelligence levels, but an enjoyable experience for all. I would recommend this as a family activity, or for out and about, as it takes up almost no space. This game is fantastic. I'd been trying to invent a tactical, strategic game myself that just uses dice. I had thought about lettered dice also, but this guy just seems to have hit the nail on the head. It's very good.